In December 2017, the small northeastern Chinese rural county of Changbai received an amount of global notoriety, as rumors spread that China was building camps near the North Korean border in anticipation of a war or regime collapse. Representative of these reports was Jane Perlez, whose work was syndicated in the Sydney Morning Herald as “On the Banks of the Tumen, China Prepares for North Korean Refugee Tide.” In the original Financial Times piece which helped to break the story, reporters Emily Feng, Xinning Lu, and Tom Mitchell gave a detailed report that noted that Changbai county’s “proximity [to North Korea] now feels like a liability.” No one ever saw the camps, even on ubiquitous satellite imagery that seems the stock-in-trade of some North Korea analyst groups. Nevertheless, Changbai’s Korean War history of taking refugees and wounded soldiers from North Korean Ryanggang province and the city of Hyesan would bear out that such preparations were both rational and within living memory for some Party elders. In foreign policy circles and among journalists, such discussion of possible upheaval near Changbai or Hyesan invariably cycles into big-picture discussions about North Korea’s ability to survive under stress, and China’s ability to both aid and intimidate the DPRK. It is but a small step from Changbai to the soundbite at conferences of academics and retired People’s Liberation Army generals in Beijing, where journalists might elicit a dramatic quotes from PRC security intellectuals like Shi Yinhong about North Korea’s potential danger as well as China’s need to prepare for anything along the border. While such discussions remain important even today, they have a side impact that is often overlooked: When the war fears pass by, does anyone care about Changbai county? Short of its role in a potential Armageddon, does Changbai matter much to North Korea, or China’s interactions with that state? Of course they still matter very much, and anyone concerned with North Korea’s future, Ryanggang province, and its interface with China, as well as how life goes on on the periphery of Jilin province, ought to be interested. Fortunately there has been some news worth conveying out of the Changbai-Hyesan juncture this week. The first point deals with mineral trade in the area. In the immediate aftermath of Kim’s visit to China in early January, one source tells Daily NK that things are picking up for North Korean minerals trade off-book with Chinese firms, focusing on Musan downriver. In Changbai, no information on illegal trade on that industrial scale with North Korea is forthcoming in government press releases. This bears out the point I made in a book chapter last year, namely that “the truth is elusive” in the area around Changbai and Hyesan and sources are hard to confirm. Tom Phillips makes a similar point, and far more succinctly, in The Guardian. To use a contemporary term, for the Chinese state “erasure” is all the rage, but not reporting on things in the first place is the surest way to keep them out of the spotlight. Nevertheless, this past week the local Public Security Bureau in Changbai did make mention of trying to increase the number and reliability of citizen informants when it came to disrupting illegal cross-border trade. But seeing North Korea purely as a venue for criminal activity and nuclear conflict, from the Changbai standpoint, would be too myopic. Xi Jinping has given all the officials in Jilin and throughout the Northeast a major (and ongoing) jolt of impetus that they need to look at ways of expanding foreign trade. This means that local officials are oriented to look outward for opportunities, as they simultaneously try to crack down on illegal business practices or disorderly development at home. And even in the event that there were no Belt and Road framework toward which to bend, Changbai’s reciprocal interface with North Korea is long-standing. It also appears that the county is a place where some experimentation is occurring with respect to North Korean-nationality residents in China. Since it is legally an “autonomous county” with a strong ethnic Korean presence and legal if not de facto bilinguality, it would make sense. A recent story from the Changbai County government indicates as much. The chair of the North Korean Residents’ Association in Changbai county has been able to apply successfully for social insurance. A translation of the unusual press release follows:1)“Changbai County Association of Overseas North Koreans Presents a Gift Embroidered Flag to the County Office of the Ministry of Social Security and Human Resources” [长白县朝侨协会向县人社局赠送锦旗], press release by the Changbai Office of Human Resources and Social Security, 9 January 2019, translated by Adam Cathcart. “The unnamed head of the North Korean residents” association in PRC Changbai brings a thank-you banner to the county government office, 28 December 2018. | Image: Changbai County Government. 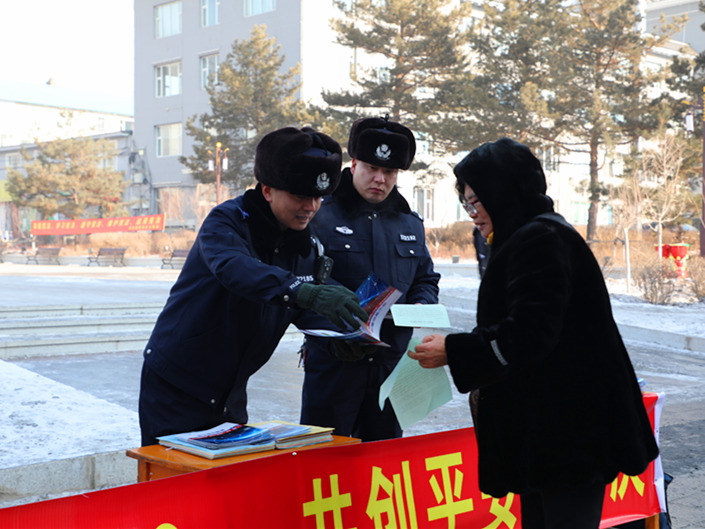 On December 26, 2018, the head of the county Association of Overseas North Koreans [朝侨协会], accompanied by two people, came to to the Changbai county government service service hall, bringing a banner to the social security card management office of the county Social Security Bureau to thank the personnel working on services for foreigners in the department of human resources and social security [人社局在办理外籍人员] for the quality and efficient service which they provided him in the process of his application for social security card. Owing to geographical location, history, and other reasons, in recent years, there are many immigrants who have lived in our Changbai county for many years and have enjoyed [享受] the status of being covered by medical insurance and social insurance. But because few of these people have ID cards [身份证, shenfenzheng, cards carried by all Chinese citizens], and others have had their foreign permanent residency documents [永久居留] issued by the Ministry of Public Security, and social security cards are insufficient [proof of residence], banks cannot open financial accounts. This situation has affected overseas Koreans, and because they have not been able to receive benefits in a regular fashion, some of them repeatedly went to the county government to petition to solve the matter. Relevant officials communicated about the policy, from the cadre in the Social Security Bureau to a team from the Public Security Bureau Exit-Entry Administration [公安局出入境管理大队] to the social security card office bank liasions, working to coordinate and resolve the difficulties for foreign-national residents in the handling of social security cards. On November 7 in Baishan city, the North Korean national Ryong Hae-ja (梁海子/량해자) was the first foreign national to receive a social security card with financial functions from County Credit Cooperatives Association, achieving a small breakthrough for foreigners residing in Baishan District. Congratulations to Mr. Ryong. Since there are not so many instances of Chinese local governments describing their interactions with North Korean residents, of any kind, some discussion is merited. First is the confusion that arises from the press release: Is the unnamed flag-bearing head of the Overseas North Korean Association simply a North Korean business association member, who lives in China on the orders of Kim Jong-un? That seems unlikely, since the association which he heads, the Chaoqiao Xiehui (朝侨协会), is distinct from the DPRK-sponsored General Federation of Koreans in China (旅华朝鲜人总联合会) or the GFKC’s constituent organizations such as the Federation of North Korean Economic Workers in China (旅华朝鲜经济人联合会) and the Association of North Korean Youth in China (旅华朝鲜人青年协会). Why would North Koreans in northeast China not follow the lead of these organizations and simply appeal to the DPRK Consulate in Shenyang? Probably because it is rather far away, but more likely because they may not have North Korean passports. It seems these are the children or descendants of North Korean citizens, often but not always women, who came to China during the Korean War. Historian Shen Zhihua describes the role of these associations in the mid-1950s, when they existed in large Chinese cities like Shanghai and the Sino-North Korean friendship was at its zenith. The Association of North Korean Residents in Shanghai maintained quasi-consular powers into the late 1980s. But it is difficult to find any references at all to the association in Northeast China since the famine of the 1990s. Judging from the paucity of references in available PRC documents, then, it is indeed remarkable that local governments in northeast China are not simply trying to be more helpful to North Korean residents with perhaps ambiguous legal standing, but propagandizing that they are doing so. The reasoning behind this ultimately appears to be located in a desire to manifest to local Chinese populations — and, perhaps, to North Korean observers in Beijing, Shenyang, and Pyongyang — that Public Security Bureaus in Northeast China are attending to their role in building positive Sino-North Korean relations. The headline for one such story demonstrates this: “Hailin City Public Security Bureau sympathetically visits seriously ill head of Association of Overseas North Koreans, advancing the friendship of the two countries” [海林市公安局看望慰问病重 朝侨协会会长，增进两国友谊]. Hailin is administratively under Mudanjiang, an eastern Heilongjiang city with long-standing ties to the Korean peninsula and the anti-Japanese guerrilla movement, part of what was known during the Japanese colonial period as “Buk Gan-do” or Northern Kando. Had the CCP been more interested in creating a Korean Autonomous Prefecture that actually overlapped fully with the ethnographic map of northeastern China, it might have been part of such a space — but that is a story for another day. The first story one can locate along similar lines seems to be from Shenyang, in August of 2018, but it, too, has a Changbai link. The story describes how a man arrived at a Public Security Bureau office in Shenyang, seeking proof of his parents’ prior residence in the city. Owing to their advanced age and inability to climb steps, they had moved to Changbai in early 2018. As is then disclosed to the police, the man’s mother, described in the story only as “Grandma Kim” had no residency papers at all. She married a solider from the Chinese People’s Volunteers in Korea, and came back to China to live with him, and never applied for regular residency or social benefits and the like. Now advanced in age and still married to the same old soldier, “Grandma Kim” was visited by a young representative of the Public Security Bureau, Ms. Zhang Qi, to give her a temporary registration and a local contact. Her husband leaned on his wartime experience to remind Ms. Zhang of his patriotic bona fides. No one got into the details as to why it had taken so long for Grandma Kim’s hukou, or residency permit, issue to be taken up with the state. It very well might be some combination of factors, but the warming in 2018 of Sino-North Korean relations certainly makes framing such nerve-wracking decisions and actions by individual families easier to frame. What is different still about this story and the the Changbai social insurance story, however, is that they start to get into the gears of citizenship, rights for the undocumented, and the extension of benefits to people who may not have the right passport, or any passport at all. It is unlikely that there are still 300,000 undocumented North Korean migrants in China, as has previously been estimated, but there are surely more than a few isolated cases that still need resolving, and which the Chinese state could aid in making easier. Does this point toward a path to citizenship for North Koreans who have fled the DPRK altogether, and who risk refoulement if discovered by local security bureaus? Not exactly, but the trend needs to be noted, encouraged, and expanded. And, for a moment at least, Changbai departs from its specificity, joining Europe and America as a site where developments of rights for migrants, and their ongoing suppression and manipulation by governments for larger and not always wholesome political purposes, are worth watching. 1. ↑ “Changbai County Association of Overseas North Koreans Presents a Gift Embroidered Flag to the County Office of the Ministry of Social Security and Human Resources” [长白县朝侨协会向县人社局赠送锦旗], press release by the Changbai Office of Human Resources and Social Security, 9 January 2019, translated by Adam Cathcart.